SUV REVIEW: The seven-passenger Audi Q7 has the rock solid feeling of a German luxury car plus Audi is known for making some of the best automotive interiors on the market today. While it's not quite up to the same standards as the phenomenal Audi A8 sedan, the Q7 still has one of the nicest cabins of any luxury SUV. Germany also has a reputation for building some of the world's best tanks. Twice, in fact, Germany has been banned from building tanks because of the literally anti-social ways they've put their tanks to use. Their tanks were so good that the Germans couldn't be trusted to build them again until the 1970s, by which time half the country was Westernized and the other half was Communized into economic oblivion. Even then, the Germans began to design and build what is widely considered one of the best tanks in the world today, the Leopard 2. It's no surprise then that Germany's Audi has decided to build its own tank called the Q7. This is an SUV you buy not just for going to the grocery store or shuttling the kids to soccer practice, any minivan could do that, but to impress your friends and coddle yourself in something that feels like it should be invading a member of OPEC. It's essentially the same vehicle as the Porsche Cayenne and Volkswagen Touareg, so you know it's got good bones. Audi stretched it about a foot to squeeze in a third-row seat, but it still has that all-German feeling of solidity because it has spiritual roots dating back to the blitzing Panzers. A luxury tank, I call it. Yes, it spoils you, as any expensive, luxed-up SUV should. The version I drove had a huge panoramic sunroof, a climate control system that lets you individually adjust both the temperature and blower settings for driver and passenger, a rear-view camera for backing up, and seats covered in leather so soft it must have come from young Swedish cows who bathed in lanolin and got deep-tissue massages every day. It also has an optional magic air suspension that can be raised and lowered for different driving conditions. That means, just by twisting a knob in the cockpit, different species of pixies take control of the suspension system to make it more comfortable on the highway, more fun on twisty roads or to give you more ground clearance for off-road driving. And it has a command system befitting a four-star general. Called the Multi Media Interface, or MMI, this system uses a single knob to control hundreds of individual settings through an LCD screen. It's how you control the navigation system, set your suspension preferences, answer a phone call, change songs on the CD player or adjust virtually any setting imaginable for a vehicle. Some people hate the MMI. They say it's too difficult to do simple things, like change the radio station. But I love it. Yes, it takes some time to learn how it works, but once you understand how it operates, the whole system is surprisingly intuitive. Other than all the gadgets in the cabin, the Q7 is like any other mid-size, seven-passenger SUV, only with a German twist. Like a good Mercedes, it feels as though the entire vehicle was machined from a single block of steel on a computer-controlled lathe. It's so solid, so Teutonic. And it has a Teutonic price to match. The loaded, V8-powered version I drove cost nearly $67,000. You can get a V6 version for cheaper than that, but I can't recommend buying it because you would be out-accelerated by sea snails swimming through 33-degree molasses. That brings us to the drawbacks of driving a luxury tank. For one, the V8 gets only 12 miles per gallon in town. For another, the third-row seat is extremely spacious and comfortable, if your rear end is the size of a thimble and you have no legs. But do those complaints really have merit? Why would anyone complain about leg room, or gas mileage, as they're invading the Polish border? What was tested? 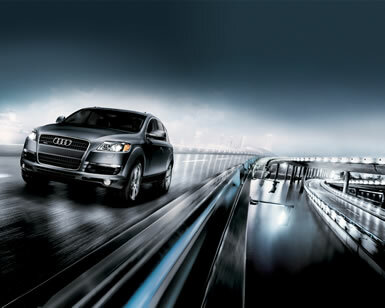 The 2008 Audi Q7 4.2 Premium with a base price of $58,600. Options on the test car: Upgraded paint at $750, air suspension for $2,600, the technology package for $850, a panoramic sunroof for $1,850, 20-inch wheels at $800 and the towing package for $550. Total MSRP price as tested including the $775 destination charge: $66,775. Why avoid it? It's expensive, gets awful gas mileage with the V8 engine and has a very cramped third-row seat. Why buy it? It has a solid, Teutonic feel and a wonderful cabin. High-tech amenities and comfortable seats make it a great luxury SUV. Driving a luxury tank is all about power, comfort and image, and the Audi Q7 provides all those, and in abundance.